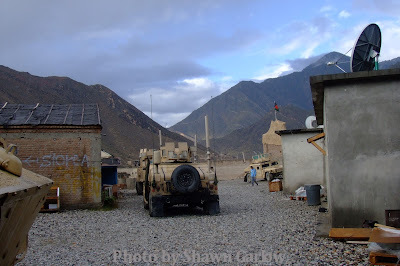 Weapons of the War in Afghanistan: Grenades, Mines, and Explosives Part II; Continued. 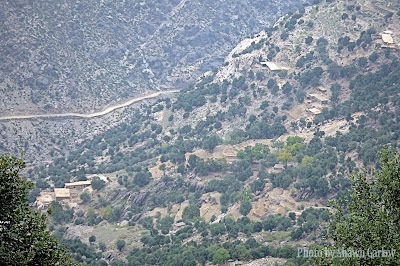 View of vehicles on the Korengal road nearing "Death Draw" from my position providing overwatch. For our seventh installment, let’s take a look at the most commonly encountered Grenades, Mines, and Explosives in the War in Afghanistan. 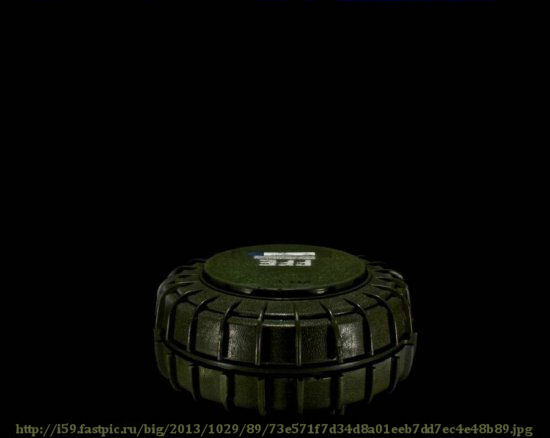 The M19 is a large square plastic cased U.S. anti-tank blast mine. Intended to replace the M15 mine, the design dates from the mid-1960s and contains only two metal components: the copper detonator capsule and a stainless steel firing pin which weighs .010 oz. It is a minimum metal mine, which makes it very difficult to detect after it has been emplaced. This mine is produced under licence in Chile, South Korea and Turkey. A copy is produced in Iran. 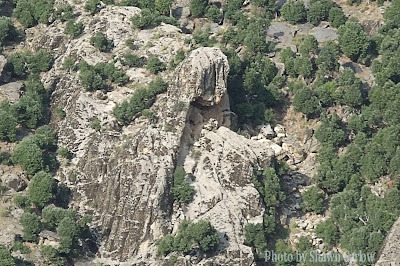 It is found in Afghanistan, Angola, Chad, Chile, Cyprus, Iran, Iraq, Jordan, South Korea, Lebanon, the Western Sahara, and Zambia. The plastic casing of the mine is usually dark olive green, and has a large central fuze well. Normally it has a carrying handle on one side. The mine is normally fitted with the M606 fuze which has an arming switch with two settings, S(afe) and A(rmed). These markings are either painted in yellow or embossed into the plastic. When the switch is set to "A" and the safety clip is removed, the mine will detonate if a vehicle drives over it. The firing mechanism is triggered by a belleville spring which flips the firing pin downwards into the stab detonator, setting off the adjacent booster charge and main explosive filling. The mine is also fitted with two secondary fuze wells which allow anti-handling devices to be fitted e.g. the M1 pull fuze or M5 "mouse-trap" anti-lift fuze. 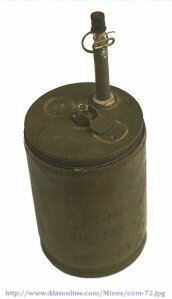 Either or both of the secondary fuze wells on an M19 mine may be fitted with an antihandling device. The Korengal Outpost as seen from OP Little Rock, Firebase Vegas, Korengal Valley, Afghanistan. The TC/6 is very common in Afghanistan. Most commonly this anti-tank mine will be daisy-chained or double/triple "stacked" having extremely devastating effects on Coalition and civilian vehicles that do not have the armor of a modern battle tank. Double/Triple stacked TC/6's can rip an armored HMMMV in half, if not completely obliterate the entire vehicle as well as it's occupants. And being that it is a minimum metal mine it is hard to detect. The TC/6 is a round minimum metal Italian anti-tank blast mines. It has a round deep ribbed plastic case that is either sand colored or olive green. The fuse works on an air pressure system, with the top pressure plate forcing air through a small bleed valve. The air then inflates a diaphragm which indirectly applies force to the striker spring until a steel restraining ball is forced out of the way of the striker. The striker is then flipped into the detonator, triggering the mine. The air pressure fuse is designed to be resistant to shock and over-pressure mine clearance techniques. It can therefore be regarded as a blast resistant mine. The mine was produced by the now-defunct Italian company, Tecnovar Italiana SpA, but is now no longer in production. In the 1970s a small number of the TC/6 version were produced in Portugal for testing and demonstration purposes only. No further production occurred. The TC/3.6 mine is found in Afghanistan, and the TC/6 is found in Afghanistan, Chad, Ecuador, and Tajikistan. Additionally, SAT electronic fuses (which can have anti-handling device capability) may be used with these mines. A copy of this mine is produced in Egypt. 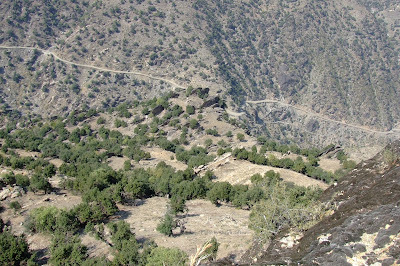 Mostly abandoned Village of Comirsa Banday near the Korengal Road. 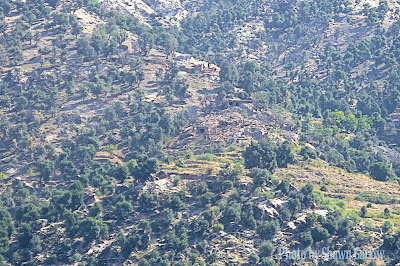 AAF/ACF fighters would often sneak into this village to setup IEDs on the Korengal road at night and sometimes though rarely during the day. 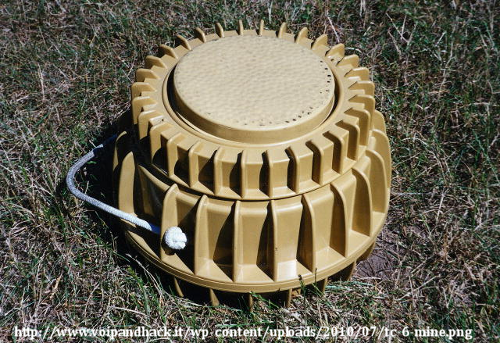 The TC/2.4 is a circular plastic cased Italian minimum metal anti-tank blast mine. The mine uses a blast and shock resistant pneumatic fuse. It could be laid by hand or mechanically, and could be fitted with anti-handling devices. An Egyptian copy of the mine is produced, designated as the M/80. The mine was used in Iraq, but is no longer produced. 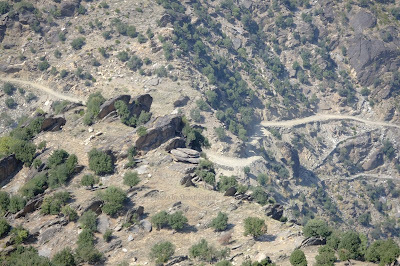 Another view of the Korengal Road near "Death Draw"
The Mk 7 mine was a circular British anti-tank blast mine. It replaced the World War 2-era Mk 5 mine, and has in turn been replaced by the L9 Bar Mine. The Mk 7 can be laid either by hand or from a mechanical mine layer. The mine is conventional in design. It has a steel casing with a central, main fuse well, below which is a tetryl booster charge, both surrounded by the main explosive filling of TNT. The mine can be fitted with a variety of fuses, including a double-impulse fuse (which gives it some resistance to explosive demining methods) or the L93A1 tilt-rod fuze, which gives it a full width attack capability. The mine has a secondary fuze well for an anti-lifting device and a mechanical anti-handling device was also produced for the mine, although this is reported to have never been used. 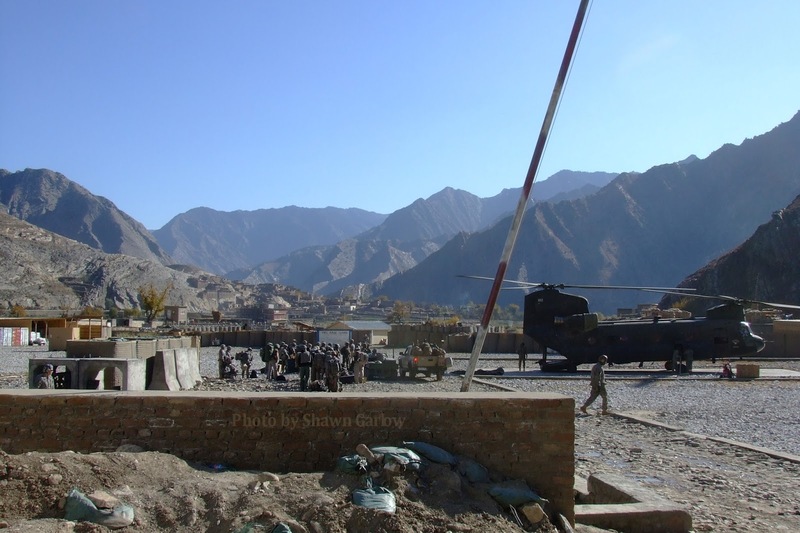 The mine is currently being phased out of service with the British army. The mine is found in Afghanistan, Angola, Cyprus, Egypt, Eritrea, Ethiopia, Lebanon, Libya, Namibia, Oman, Somalia, and Zambia. The two most modern variants of the mine, the Mk 7/4 (standard) and the Mk 7/7 (waterproof), were taken out of service by the UK by March 2003, after which disposal of existing stockpiles commenced. 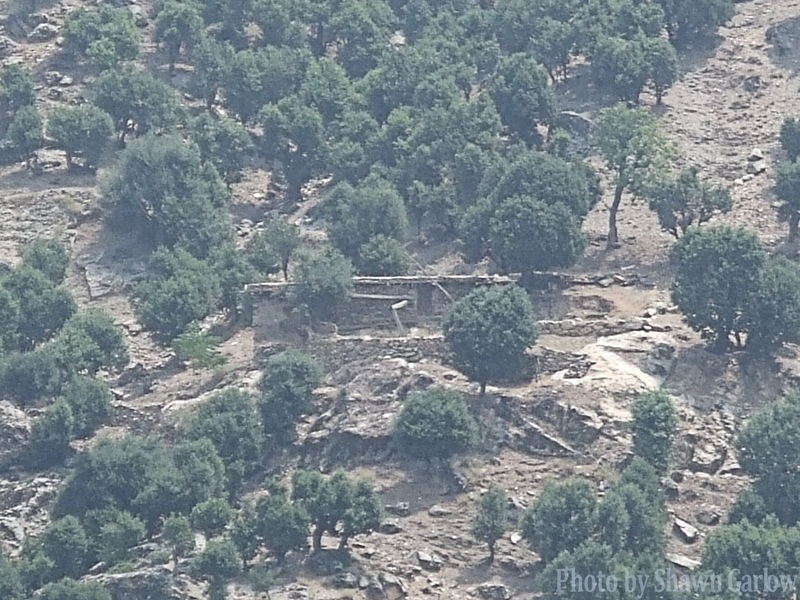 Elders visiting the Korengal Outpost. The POMZ-2 can often be found on trails known to be used by coalition forces as well as used to booby trap doors and other structures. These are very easy to hide. I have seen them fixed to trees bordering trails and paths, and have also heard of others that have tripped them entering structures. The POMZ-2 is a type of Soviet-made stake mounted anti-personnel fragmentation mine. The POMZ mine was used during the Second World War. It was superseded by the POMZ-2, and later by the improved POMZ-2M. These mines (and copies thereof) have been used in numerous conflicts, including the Vietnam War and the Korean War. The mines consist of a small TNT explosive charge inside a hollow cylindrical-cast iron fragmentation sleeve. The sleeve has large fragments cast into the outside and is open at the bottom to accept the insertion of a wooden or plastic mounting stake. On top is a weather cap, covering a standardized fuse well, which in operation is normally armed with an MUV or VPF tripwire fuse. The tripwire can be set to detonate via both pressure or pressure release. The POMZ-2M has a threaded fuse well, while the earlier POMZ-2 was unthreaded and the fuse and igniter would sometimes fall out if the mine was disturbed. The POMZ-2 has 6 rows of square preformed fragments, while the POMZ-2M has 5 rows and is slightly shorter. The crude fragmentation jacket produces an uneven fragmentation effect. The effective radius of the mine is often quoted as 4 meters @ 360 degrees, but a small number of large fragments may be lethal at ranges far exceeding that. The wooden stakes tend to rot in tropical climates, leaving the mine, if armed, in an extremely unpredictable state. Soldiers at Firebase Vegas during some down time. Korengal Valley, Afghanistan. 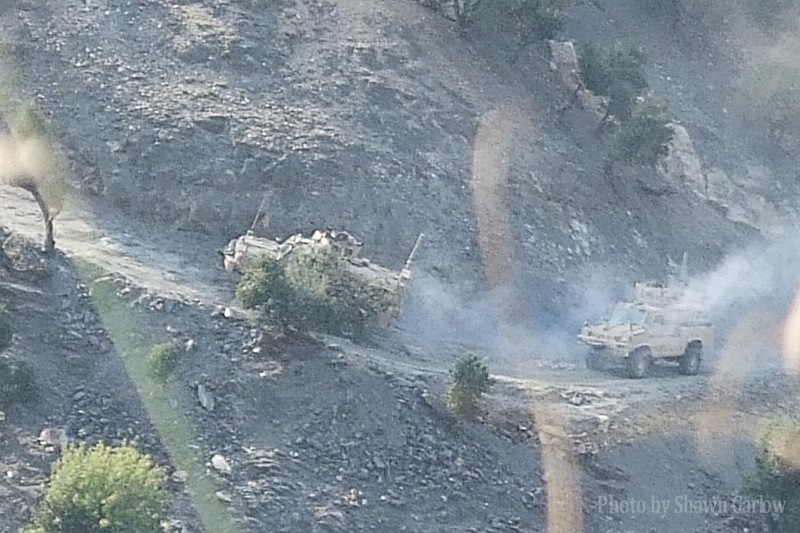 By far the number one killer of US and coalition forces in Afghanistan, the IED is a silent and unseen weapon that is violently quick and indiscriminate in its unforgiving and brutally devastating effect. It has shifted the way that we fight wars, and conduct movements & operations. It has rapidly spurred new technologies and methods of detection. 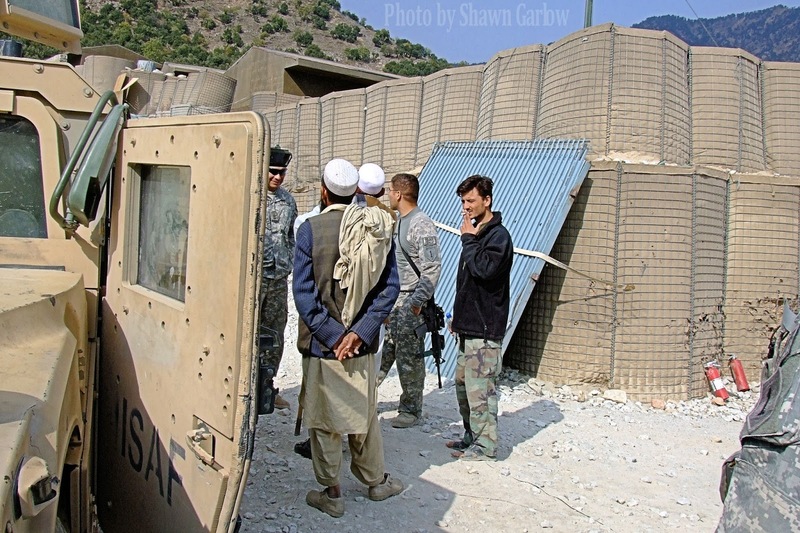 Though when new methods of detection are developed, so too are new ways of deploying, triggering, and concealing IEDs. 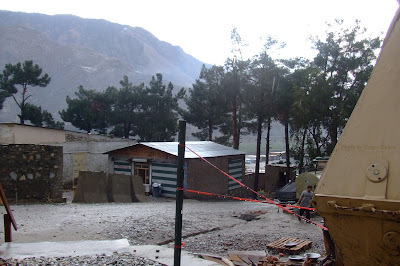 Unfortunately, due to the witnessed effectiveness of the IED in both long wars of Afghanistan and Iraq, IEDs will probably remain a staple of war and conflict for the perceivable future. An Improvised Explosive Device (IED) is a bomb constructed and deployed in ways other than in conventional military action. It may be constructed of conventional military explosives, such as an artillery round, attached to a detonating mechanism. 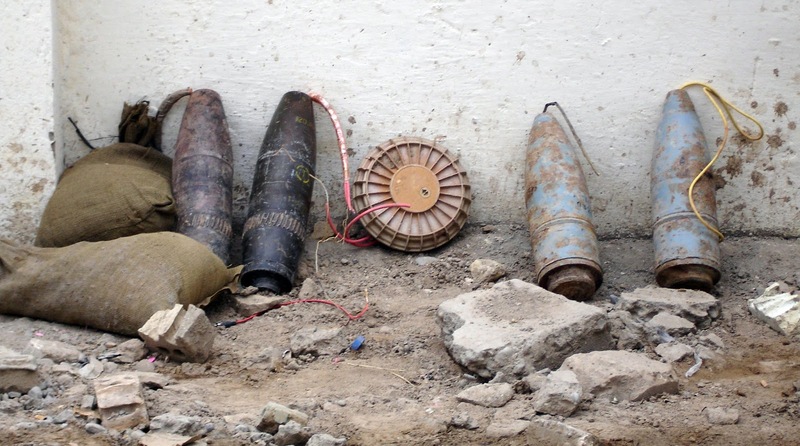 IEDs are commonly used as roadside bombs. IEDs are generally seen in heavy terrorist actions or in unconventional warfare by guerrillas or commando forces in a theater of operations. In the second Iraq War, IEDs were used extensively against US-led invasion forces and by the end of 2007 they had become responsible for approximately 63% of coalition deaths in Iraq. 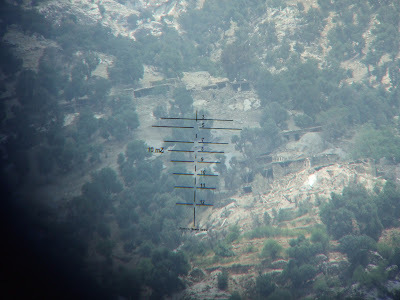 They are also used in Afghanistan by insurgent groups, and have caused over 66% of coalition casualties in the 2001–present Afghanistan War. The term comes from the British Army in the 1970s, after the Provisional Irish Republican Army (IRA) used bombs made from agricultural fertilizer and Semtex smuggled from Libya to make highly effective boobytrap devices or remote-controlled bombs. An IED is a bomb fabricated in an improvised manner incorporating destructive, lethal, noxious, pyrotechnic, or incendiary chemicals and designed to destroy or incapacitate personnel or vehicles. In some cases, IEDs are used to distract, disrupt, or delay an opposing force, facilitating another type of attack. 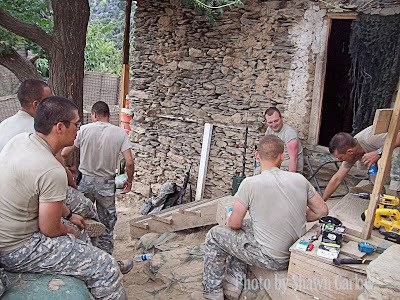 IEDs may incorporate military or commercially sourced explosives, and often combine both types, or they may otherwise be made with homemade explosives (HME). An IED has five components: a switch (activator), an initiator (fuse), container (body), charge (explosive), and a power source (battery). An IED designed for use against armored targets such as personnel carriers or tanks will be designed for armor penetration, by using a shaped charge that creates an explosively formed penetrator. IEDs are extremely diverse in design and may contain many types of initiators, detonators, penetrators, and explosive loads. Antipersonnel IEDs typically also contain fragmentation-generating objects such as nails, ball bearings or even small rocks to cause wounds at greater distances than blast pressure alone could. 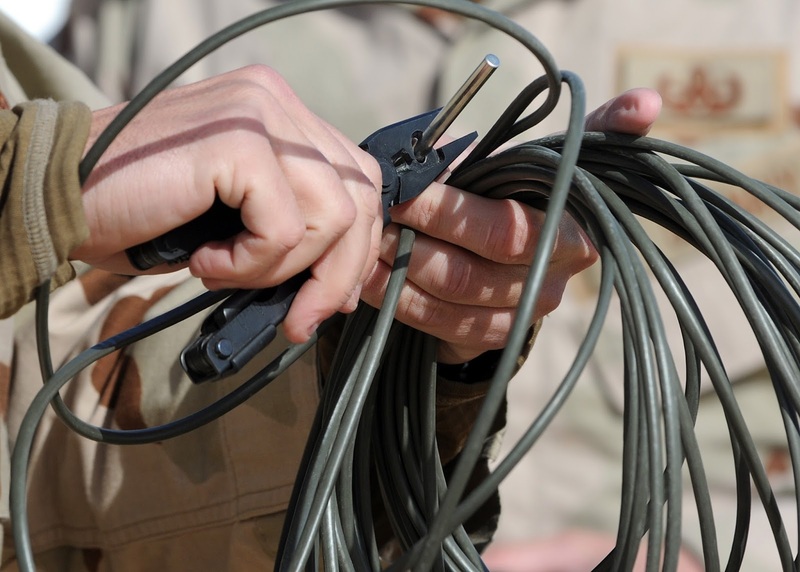 IEDs are triggered by various methods, including remote control, infrared or magnetic triggers, pressure-sensitive bars or trip wires (victim-operated). In some cases, multiple IEDs are wired together in a daisy chain to attack a convoy of vehicles spread out along a roadway. IEDs made by inexperienced designers or with substandard materials may fail to detonate, and in some cases, they actually detonate on either the maker or the emplacer of the device. Some groups, however, have been known to produce sophisticated devices constructed with components scavenged from conventional munitions and standard consumer electronics components, such as mobile phones, washing machine timers, pagers, or garage door openers. The sophistication of an IED depends on the training of the designer and the tools and materials available. 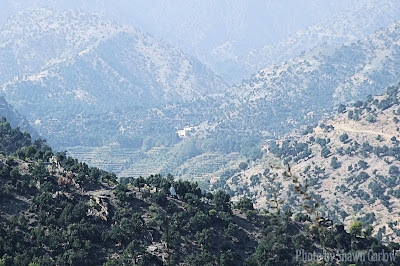 View towards the South of the Korengal Valley. Det. 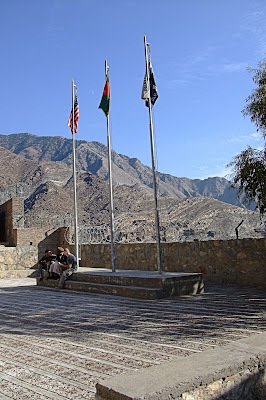 cord can be found all over Afghanistan; usually in conjunction with C-4. It has other uses than just detonating explosives. It can also be used to clear out smaller sized trees to create landing zones, use in improvised breaching devices, as well as other uses. Detonating cord (also called detonation cord, detacord, det. cord, detcord, primer cord or sun cord) is a thin, flexible plastic tube usually filled with pentaerythritol tetranitrate (PETN, pentrite). With the PETN exploding at a rate of approximately 4 miles per second, any common length of detonation cord appears to explode instantaneously. It is a high-speed fuse which explodes, rather than burns, and is suitable for detonating high explosives. The velocity of detonation is sufficient to use it for synchronizing multiple charges to detonate almost simultaneously even if the charges are placed at different distances from the point of initiation. It is used to reliably and inexpensively chain together multiple explosive charges. 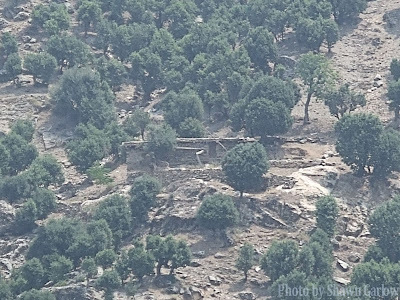 Typical uses include mining, drilling, demolitions, and warfare. As a transmission medium, it can act as a downline between the initiator (usually a trigger) and the blast area, and as a trunkline connecting several different explosive charges. As a timing mechanism, detonation cord detonates at a very reliable rate (about 7,000–8,000 m/s), enabling engineers to control the pattern in which charges are detonated. This is particularly useful for demolitions, when structural elements need to be destroyed in a specific order to control the collapse of a building. While it looks like nylon cord, the core is a compressed powdered explosive, usually PETN (pentrite), and it is initiated by the use of a blasting cap. Detonation cord will initiate most commercial high explosives (dynamite, gelignite, sensitised gels, etc.) but will not initiate less sensitive blasting agents like ANFO on its own. 25 to 50 grain/foot (5.3 to 10.6 g/m) detonation cord has approximately the same initiating power as a #8 blasting cap in every 2 to 4 inches (5 to 10 cm) along its entire length. A small charge of PETN, TNT, or other explosive booster is required to bridge between the cord and a charge of insensitive blasting agent like ANFO or most water gels. "Mortar Rock" as the name implies this is a area where AF/ACF fighters would launch indirect fire from at Firebase Vegas. 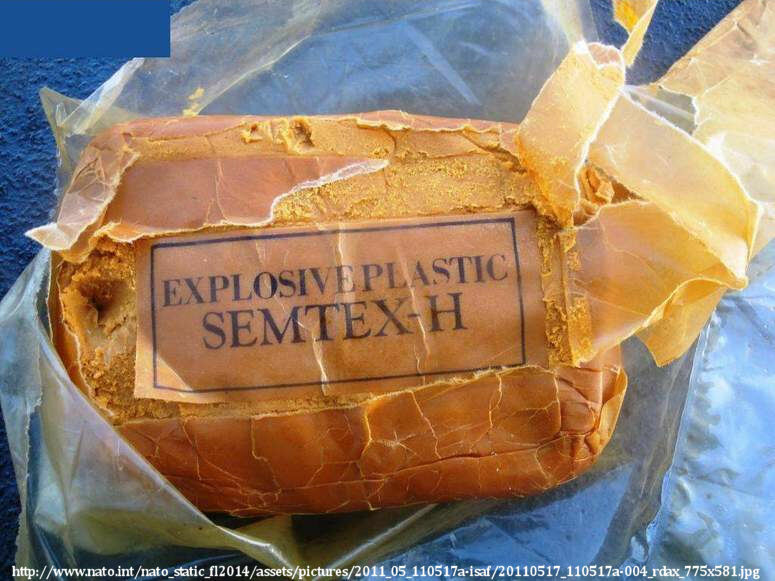 Semtex is a general-purpose plastic explosive containing RDX and PETN. It is used in commercial blasting, demolition, and in certain military applications. Semtex became notoriously popular with terrorists because it was, until recently, extremely difficult to detect, as in the case of Pan Am Flight 103. For its original military use it was manufactured under the name B 1. It has been manufactured in Czechoslovakia under its current name since 1964, labeled as SEMTEX 1A, since 1967 as SEMTEX H and since 1987 as SEMTEX 10. Semtex was invented in the late 1950s by Stanislav Brebera, a chemist at VCHZ Synthesia, Czechoslovakia (now Czech Republic). The explosive is named after Semtín, a suburb of Pardubice where the mixture was first manufactured starting in 1964. The plant was later renamed to become Explosia a.s., a subsidiary of Synthesia. Semtex was very similar to other plastic explosives, especially C-4, in being easily malleable; but it is usable over a greater temperature range than other plastic explosives, since it stays plastic between −40 and 140 °F; it is also waterproof. There are also visual differences: while C-4 is off-white in color, Semtex is red or brick-orange. The new explosive was widely exported, notably to the government of North Vietnam, which received 14 tons during the Vietnam War. However, the main consumer was Libya; about 700 tons of Semtex were exported to Libya between 1975 and 1981 by Omnipol. It has also been used by Islamic militants in the Middle East and by the Provisional Irish Republican Army (IRA) and the Irish National Liberation Army in Northern Ireland. Exports fell after the name became closely associated with terrorist attacks. Export of Semtex was progressively tightened and since 2002 all of Explosia's sales have been controlled by a government ministry. As of 2001, only approximately 10 tons of Semtex were produced annually, almost all for domestic use. "Cave Rock" named so as it looks like a cave. 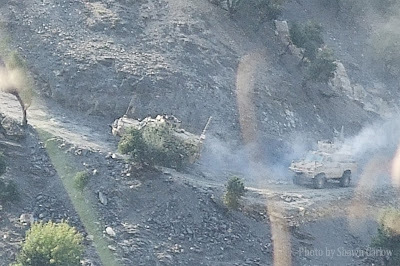 AAF/ACF fighters would often use this position right outside of Firebase Vegas to attack the firebase. Like most stickgrenades, this Chinese type had a friction fuse with a pull wire which went through the handle. The threaded safety cap gave access to a pull ring. Although similar in design to the infamous German Model 24 Stielhandgranate, it was poorly manufactured and resulted in many duds. Some of these Grenades may be filled with Picric Acid explosive which can become sensitive with age. Charge/filler: 0.92 oz of differing explosives. Korengal Road near "Death Draw" an area of elevated IED/roadside bomb/mine activity. Korengal Valley, Afghanistan. The Soviet F1 hand grenade, is an anti-personnel fragmentation defensive grenade. It is based on the French F1 grenade and contains a 60-gram explosive charge (TNT). 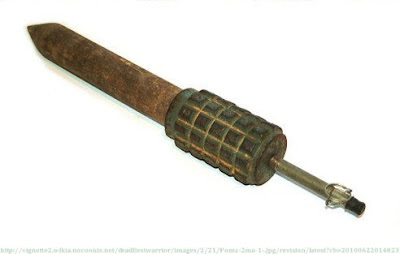 The UZRGM (“Universal Igniter, Hand Grenade, Improved") fuse is a universal Russian type also used in the RG-41, RG-42, RGO-78, RGN-86 and RGD-5 grenades. The standard time delay for this fuse is 3.5 to 4 seconds. However, UZRGM fuse variants are available which give delays between zero (i.e., instantaneous, specifically for use in booby-traps) and 13 seconds. It is possible to hear a loud "pop" as the fuse ignites and begins to burn. Additionally, it is possible to screw an MUV booby-trap firing device into the fuse well. 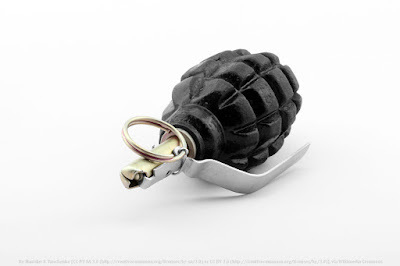 The F1 grenade has been supplied to various foreign countries over the years, including Iraq and other Arab nations, and there are different production variations according to country of origin (in terms of finish, markings and spoon/lever design). Though obsolete and no longer in production, it can still be encountered in combat zones. 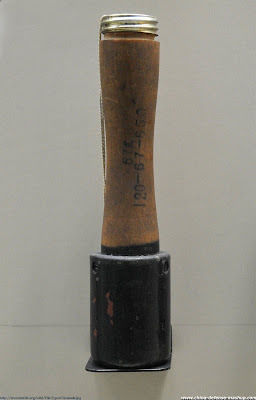 The RGD-5 is a post World War II Soviet anti-personnel fragmentation grenade, designed in the early 1950s. The RGD-5 was accepted to service in 1954, and is still in service with many of Russia's former client states and has been supplied to Iraq as well as other Arab nations. 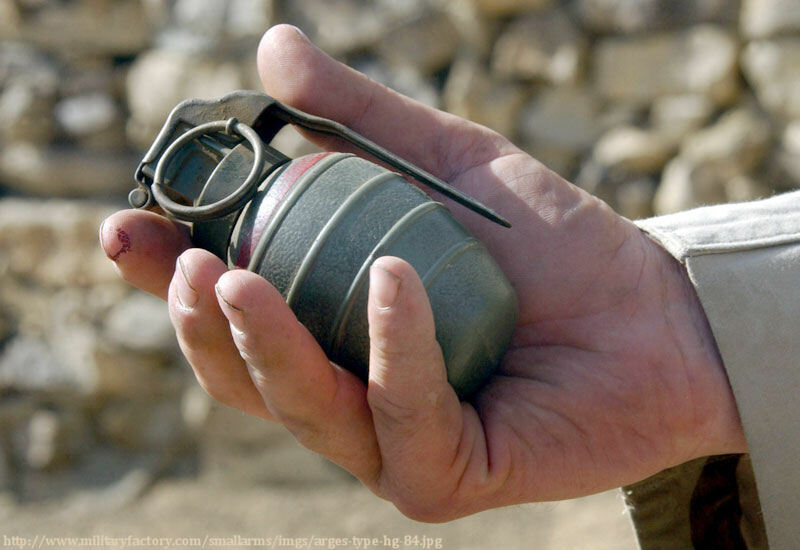 The grenade contains a 3.9 oz charge of TNT with an internal fragmentation liner that produces around 350 fragments and has a lethal radius of 25 meters. The weight of the grenade with the fuse fitted is 11 oz. Typically, the RGD-5 uses the 3.2 to 4 second delay UZRGM fuze. The RGD-5 may also be fitted with the more modern DVM-78 fuse, or variants of the UZRGM with delays of between zero (i.e. instantaneous for use in booby traps) and 13 seconds. It is also possible to screw an MUV booby-trap firing device into the fuse well. The grenade is egg-shaped with no external ribbing, except for a lateral ridge where the two halves of the grenade join. The surface has a few small dimples on it with a green or olive drab, paint-scheme. The RGD-5 can be thrown about 35 to 45 meters by the average soldier and when thrown, it is possible to hear a loud "pop" as the fuse ignites and begins to burn. The grenade can inflict injuries (e.g. penetrating eye wounds) out to 15 meters from the site of detonation. Victims caught within 3 meters of the detonation site are almost certain to be killed or severely wounded. 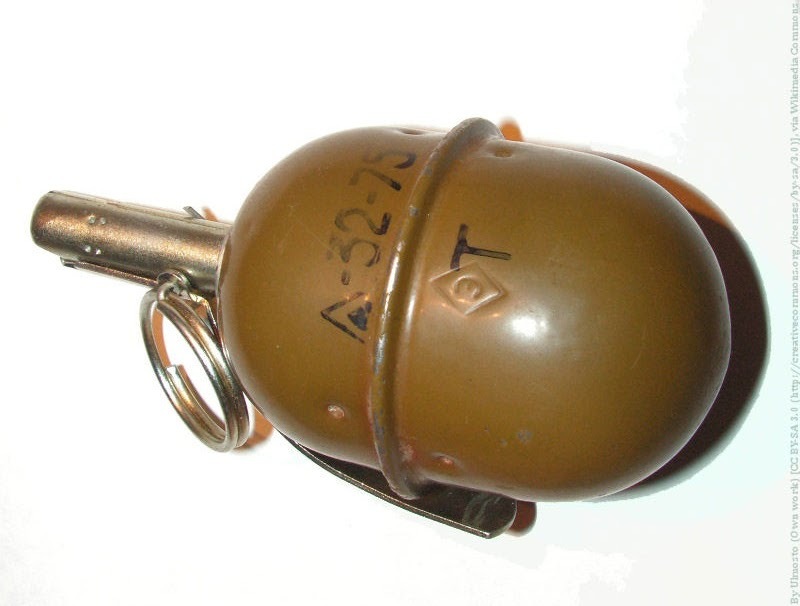 This grenade is still manufactured in Russia with copies produced in Bulgaria, China (as the Type 59), and Georgia. Many millions of RGD-5s and its clones have been manufactured over the years and although not as advanced as more modern grenades, the RGD-5 is still an effective and inexpensive weapon. A single RGD-5 grenade costs around $5 US, making it highly affordable during a major conflict when many grenades are required. Effective Range: 3 m kill radius, 15-20 m casualty radius. The Arges 84-P2A1 is a Pakistani copy/ripoff of the Austrian Arges HdGr 84. It has a high occurance of use in terrorist attacks in Southern Asia, and seem to be widely available. 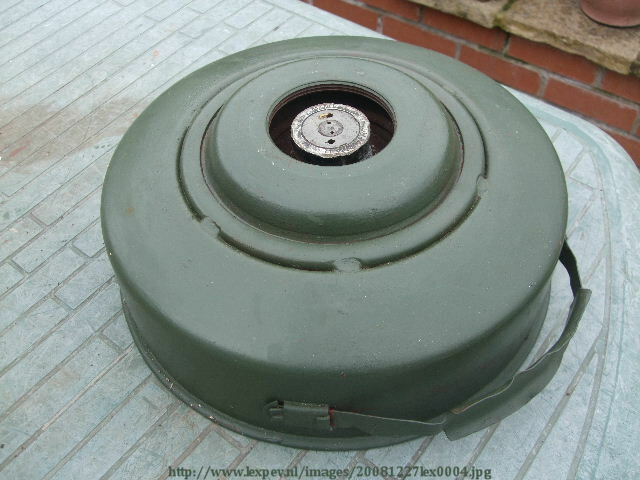 The OZM-72 is a Soviet manufactured bounding mine type anti-personnel mine. They are normally painted olive green, and issued with a spool of tripwires and two green painted wooden or metal stakes for affixing the tripwires. The OZM-72 also contains preformed steel fragments, and is issued with empty fuse wells, so a variety of fuse options are possible. The mine can be activated by a variety of fuses, including electronic fuses or command initiation, although they are most commonly fitted with an MUV booby trap switch which is activated by a tripwire. On firing, a metal base plate remains in the ground, while the mine body is thrown up by a small lifting charge, but remains attached to a strong wire tether. When the end of the tether is reached at a height of approximately 0.5 m, the main charge explodes and scatters fragments of the casing across a wide area. On the LZ at Camp Blessing. The SB-81 is an Italian plastic cased minimum metal anti-tank blast mine dating from the early 1980s. The mine uses an air pressure based fuze, which gives it protection against overpressure and blast. It can therefore be regarded as a blast resistant mine. The mine can be scattered by hand or by mine laying systems. The mine is found in the Falkland Islands and the Western Sahara. An electronically fused version of this mine (the SB-81/AR-AN) was also produced which featured an integral anti-handling device plus self-destruct capability. YM-II: This is an Iranian copy of the mine, its specifications are slightly different from the SB-81. It weighs 7.05 lbs and has a main charge of 4.41 lbs of Composition B. 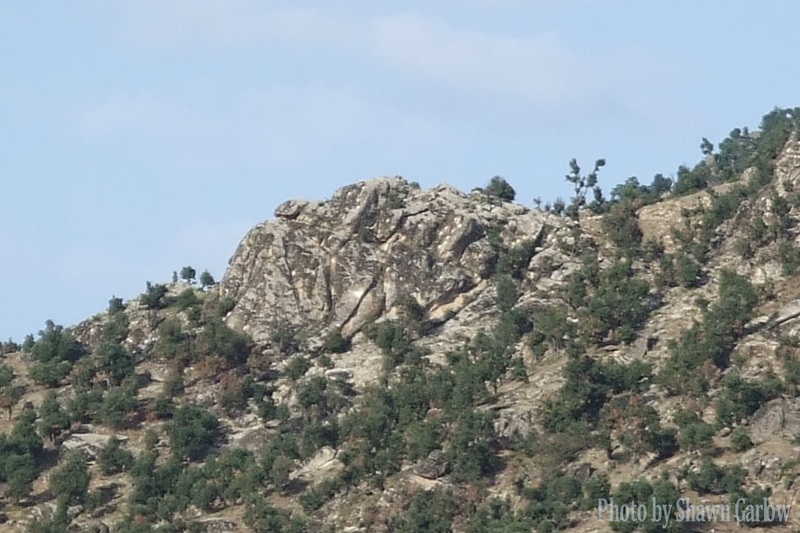 It is produced in olive green or sand colored ABS plastic and is found in Afghanistan and Iran. 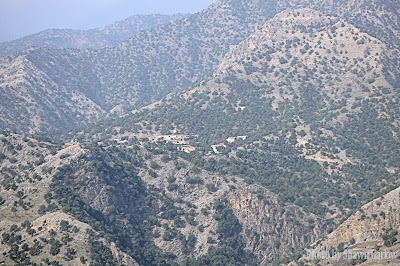 Abandoned Village of Hanuk Banday seen from OP Rock, Firebase Vegas, through an m-145 optic on a M240B. 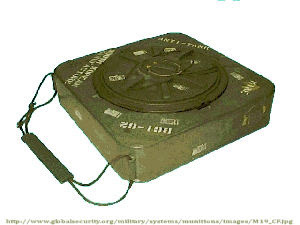 The YM-III or YM-3 is a circular ABS plastic cased Iranian minimum metal anti-tank blast mine. 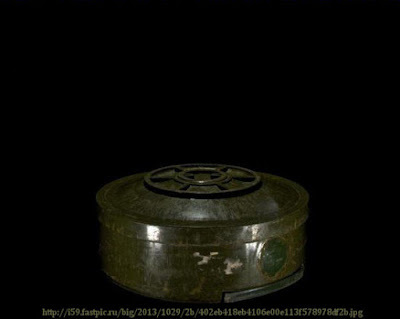 It is a copy of the Chinese Type 72 non-metallic anti-tank mine. The mine uses a blast resistant fuze, which relies on gradual application of pressure to trigger it. 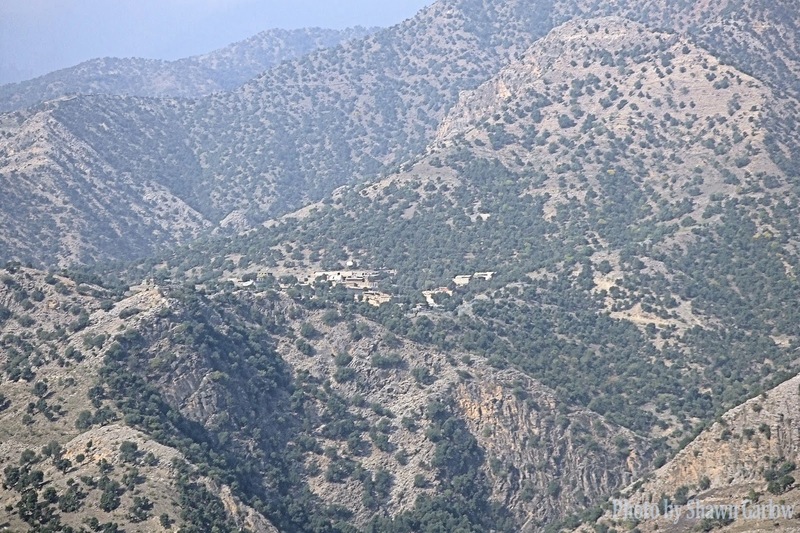 The mine is found in Afghanistan, Bosnia, Iran, and Iraq. 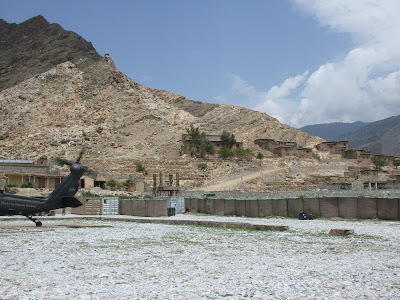 Abandoned house outside the wire along the northeastern side of Firebase Vegas, Korengal Valley, Afghanistan. 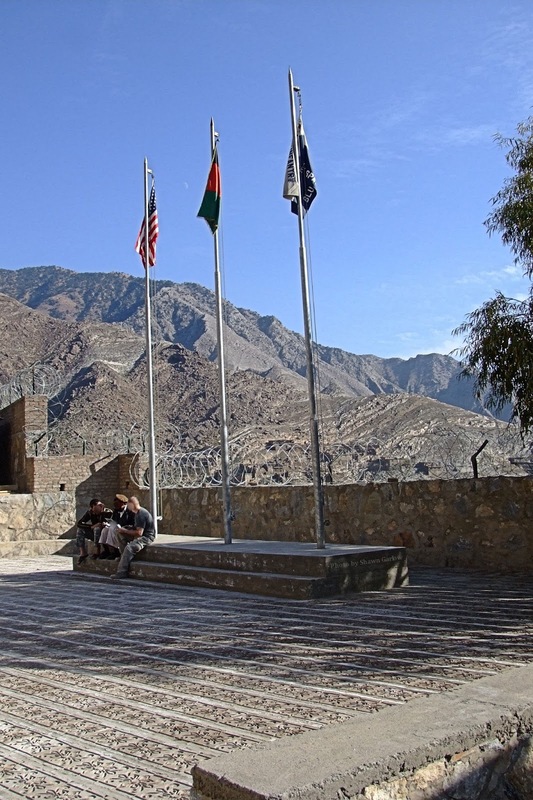 This structure would often be used by AAF/ACF fighters as cover to attack Firebase Vegas. The TM-46 mine is a large, circular, metal-cased Soviet anti-tank mine. It utilizes either a pressure fuse or tilt-rod, which is screwed into the top. Anti-tank mines with this type of fuse were capable of inflicting much more damage to armored vehicles. The TMN-46 is a variant of the mine fitted with a secondary fuse well on the bottom (where it cannot be seen) which is slightly off-set from the center of the mine. This secondary fuse well can be fitted with a pull-fuse which functions as an anti-handling device. The mine was used by the North Vietnamese forces during the Vietnam War, and is found in many countries in Africa, the Middle East and South East Asia. The abandoned village of Hanuk Banday after bombing runs during which there was heavy engagement with AAF/ACF/ fighters.